Zaltys is the reason the Doctor doesn’t let Adric pilot the Tardis. And it’s also the reason why the Alzarian prodigy should never, ever, under any circumstances be allowed anywhere near anything even resembling a control console again as long as he lives. Which, at this stage of the game and according to accepted Whoniverse mythology, isn’t going to be all that much longer. Having been persuaded (although cajoled and strong armed might be slightly more appropriate) by Tegan to try and do what the Doctor can’t, and take her home, whilst attempting to do so Adric is “kidnapped” and a few moments later Tegan suffers the same fate. 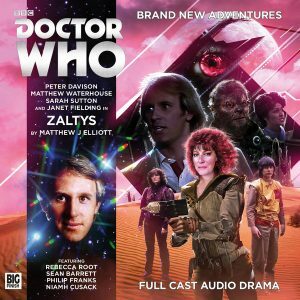 Racing to find their friends, the Doctor and Nyssa follow the only clue the have and travel to Zaltys, a seemingly dead world, to rescue Adric and Tegan. But like most things involving the Doctor, all isn’t what it seems to be, as threatened by a cataclysmic event, the inhabitants of the notoriously xenophobic world have taken precautionary measures to ensure the survival of their race, but in doing so, have inadvertently doomed themselves. And only the Doctor, his friends and a handful of rag-tag observers and a fortune hunter in the wrong place at the wrong time are all that stand between the inhabitants of Zaltys and an incredibly grizzly and horrific end.